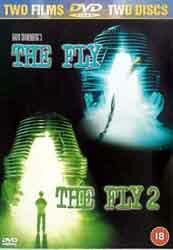 What a nice, neat package - a two disc set of The Fly and Fly 2. Generously priced, a full 5.1 soundtrack and encoded anamorphically in 16:9. Okay, so the extras are pretty poor but at this price you'd be hard pressed to complain about lack of value. The Fly remains one of the most uncomfortable horror movies of all time. The slow decay of a man as he transforms into a monster is truly chilling and if you can ignore the aged-looking computer graphics and some pretty nasty hair cuts (did people actually have hair like that?) there's very little to fault the film. Darkly sinister, coldly observed and well paced, The Fly remains the gothic classic it was hailed to be when first released. Fly 2 tries very hard but somehow its internal logic just doesn't hang together. In truth it was never going to be easy to create a sequel but this is a brave - and often effective - attempt, albeit lacking some of the wit of the previous movie. There are moments when the horror turns nasty, cheapening its narrative thrust, but on the whole it's as good as could be hoped for under difficult circumstances: there's no way it could have topped its classic predecessor. All prices correct at time of going to press. Review Graveyard regrets it can take no responsibility for price changes made by any of the participating stores.